Ulla, a 1-year-old tabby, is expecting kittens. A cat's hilarious reaction to news that she's expecting kittens has gone viral. Ulla, a 1-year-old tabby, was turned in to a shelter in Greenland after she was found on the street. Shelter board member Tone Frank told "Today" that after a few weeks the staff noticed Ulla was getting a "little chubby," so they took her to the vet to get scanned. 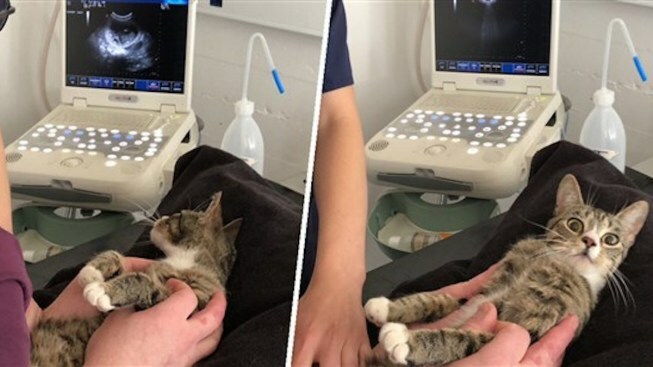 Side-by-side photos posted on the social media site show the cat first glancing at the sonogram and then turning to the camera with a look of complete shock on her face. The picture, captioned "When you find out you're pregnant," was shared to Reddit this week. It was quickly up-voted more than 90,000 times. Frank told "Today" Ulla's carrying four to five kittens, though the veterinarian said it could be hard to detect the number of heartbeats when she's so far along in her pregnancy.